The Philadelphia Flyers on Monday fired coach Peter Laviolette and replaced him with assistant coach Craig Berube. In addition, assistant coach Kevin McCarthy, who had also worked with Laviolette with the Carolina Hurricanes, was let go. Added to the coaching staff were director of player personnel John Paddock and director of player development Ian Laperriere. Holmgren called the move a "gut feeling" he had on the plane ride home from Carolina on Sunday after the Flyers' 2-1 loss, their third straight to start the season. "Right from Day 1 of training camp I was concerned about how the team looked," Holmgren said. "We have a long way to go in terms of the season, but it was more about how we played, and it was unacceptable. We don't look like a team at all. "It just came to that point where I had a gut feeling on my part where I felt we needed a change." It was less than a month ago that team chairman Ed Snider had given Laviolette a vote of confidence. "As far as Peter is concerned, last year was an anomaly," Snider told reporters on Sept. 13. "He's been a very good coach for us, he's been a good coach in this League, and we're just thrilled to have him." However, Snider said Monday that he had his issues with the team's 1-5-1 preseason, as well as the winless start to the regular season. "Training camp was a disaster," he said. "I've been at 47 training camps and I've never seen one that I thought was worse. Now that's not talking about Peter, that's talking about our players. And it carried right on over to the first three games of the season." Holmgren said he had plans to meet with the players Monday afternoon and that they would be held accountable as well. "I'm not going to let the players off the hook," he said. "Things have to get better and they will."" Berube was in his seventh season as an assistant coach with the Flyers, including the last six on the staffs of John Stevens and Laviolette. "I'm excited about the opportunity to have Craig coach the Philadelphia Flyers," Holmgren said. "Craig is one of the smartest guys I've ever been around. He demands respect, he holds people accountable and he's a no-B.S. kind of guy. I'm looking forward to Craig taking over the team." Berube's first game will be Tuesday, when the Flyers host the Florida Panthers. This is Berube's first chance as an NHL head coach. His only other experience as a head coach came in parts of two seasons with the Flyers' American Hockey League team, the Philadelphia Phantoms, in 2006-07 and 2007-08, in which he went a combined 52-30-8. Berube said his first task would be improving the team's defense. In the first three games, the Flyers allowed nine goals. "I believe that we need to play better without the puck," Berube said. "When you play good hockey without the puck, the team comes together and you do the right things to get the puck back and you keep the puck out of your net. Right now we need to stress that and do a better job of it. We need to take pride in it." The roster Berube inherits hasn't played well with or without the puck. The team has three goals in three games, but only one at even-strength. The top line of Claude Giroux, Scott Hartnell and Jakub Voracek has combined for zero points and a minus-2 rating, while Wayne Simmonds, Matt Read and Sean Couturier also have been held off the score sheet. "We're just not playing the way we have to play," Holmgren said. "We're not playing well enough to win in the National Hockey League, and that has to change. Whether it's fresh ideas or a new voice, I'm not going to sit here and try to pinpoint that. That's up to Craig. That's his job. But I didn't like the direction that the team was heading, and I felt we needed a change." It's the second straight season the Flyers have opened 0-3-0, and the fourth time in club history. Berube said he and the rest of the coaching staff could sense something not quite right with the team during training camp and through the preseason games. "We didn't play very well in preseason, whether you have a full lineup or not," Berube said. "We just didn't see the competiveness and the team-oriented play that's needed on a nightly basis to win hockey games." Berube said he'll be more demanding on the players. "Sometimes players think that they are playing hard enough and they're not," he said. "… Every player is accountable to his teammates, that's basically what it boils down to. You've got to be accountable to your teammates and play hard." Laviolette's firing three games into a season is the earliest a coaching change has been made since Fred Glover was let go by the California Seals three games into the 1971-72 season. Holmgren said any thought to firing Laviolette last season in the wake of the club's 10th-place finish in the Eastern Conference were "fleeting." He said he hoped the offseason additions of center Vincent Lecavalier, defenseman Mark Streit and goalie Ray Emery would advance the strong finish the club had to last season, when it went 6-1-0 in the final seven games. "I like Peter," Holmgren said. "I think that he deserved another opportunity. We made some changes in the summer that got us all excited. … I think it was the right thing to do at the time. Start training camp, start the year with Peter. I just didn’t like what I was seeing. It was a gut decision." 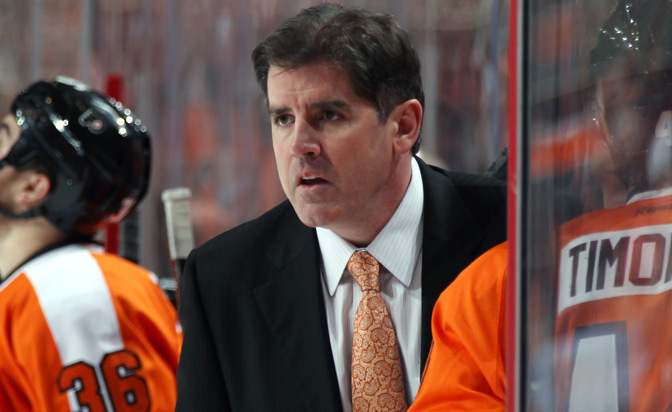 Laviolette was hired Dec. 4, 2009, and in parts of five seasons went 145-98-29. When he opened this season as coach, he joined Fred Shero as the only men in club history to coach the Flyers for a fifth season. Shero lasted seven seasons and won the only Stanley Cups in Flyers history, in 1974 and 1975. Laviolette went 23-22 in the Stanley Cup Playoffs, topped by the team's trip to the 2010 Stanley Cup Final. However, they missed the playoffs last season, the first time that had happened since 2007. In 12 seasons as an NHL coach with the New York Islanders, Hurricanes and Flyers, Laviolette is 389-282-88. He guided the Hurricanes to the 2006 Stanley Cup. He also will serve as an assistant coach for the United States at the 2014 Winter Olympics. Berube started his NHL career with the Flyers in 1986-87 season and was a rookie on the team that lost to the Edmonton Oilers in the 1987 Stanley Cup Final. In six seasons in two different stints as a player with the Flyers, he had 58 points and 1,138 penalty minutes in 323 games. He played 17 seasons in all, with the Flyers, Toronto Maple Leafs, Calgary Flames, Washington Capitals and New York Islanders, totaling 159 points in 1,054 games. He ranks seventh in League history with 3,149 penalty minutes. Laperriere had been in his second season as the club's director of player development after announcing his retirement as a player in the summer of 2012 due to concussion issues. This will be the first time he has coached at any professional level. "John Paddock has been around forever," Berube said. "He was actually my first pro coach in Hershey (1986-87). He's a very smart guy, he knows the game really well and has experience. Laperriere, we all know how 'Lappy' played the game with his heart, put everything on the line every night. He brings a lot of positive attitude, so I am looking forward to having them both there." Joe Mullen will remain as an assistant coach, and Jeff Reese will remain as goaltending coach.